At the risk of oversimplifying, we can categorize Spurgeon’s sufferings as spiritual, emotional, and physical—although recognizing the interplay of categories. To Spurgeon, no suffering he later endured could equal this devastating bitterness of soul. These spiritual sufferings taught him to loathe the foulness of sin and to cherish the holiness of God. And they engendered within him a seraphic joy in his salvation. On the evening of October 19, 1856, Spurgeon was to commence weekly services at the Royal Surrey Gardens Music Hall. That morning he preached at New Park Street Chapel on Malachi 3:10: “Prove me now.” With chillingly prophetic voice he declared, “ . . . I may be called to stand where the thunderclouds brew, where the lightnings play, and tempestuous winds are howling on the mountain top. Well, then, I am born to prove the power and majesty of our God; amidst dangers he will inspire me with courage; amidst toils he will make me strong. . . . We shall be gathered together tonight where an unprecedented mass of people will assemble, perhaps from idle curiosity, to hear God’s Word; and the voice cries in my ears, ‘Prove me now.’ . . . See what God can do, just when a cloud is falling on the head of him whom God has raised up to preach to you. . . .
That evening Surrey Hall, capable of holding up to twelve thousand, was overflowing with an additional ten thousand people in the gardens. The service was underway when, during Spurgeon’s prayer, several malicious miscreants shouted, “Fire! The galleries are giving way!” In the ensuing panic, seven people died and twenty-eight were hospitalized with serious injuries. Spurgeon, totally undone, was literally carried from the pulpit and taken to a friend’s house where he remained for several days in deep depression. A few months later he described in a sermon one experience during this period of affliction: “When I was racked some months ago with pain, to an extreme degree, so that I could no longer bear it without crying out, I asked all to go from the room, and leave me alone; and then I had nothing I could say to God but this, ‘Thou art my Father, and I am thy child; and thou, as a Father, art tender and full of mercy. I could not bear to see my child suffer as thou makest me suffer, and if I saw him tormented as I am now, I would do what I could to help him, and put my arms under him to sustain him. Wilt thou hide thy face from me, my Father? Wilt thou still lay on a heavy hand, and not give me a smile from thy countenance?’ . . . so I pleaded, and I ventured to say, when I was quiet, and they came back who watched me: ‘I shall never have such pain again from this moment, for God has heard my prayer.’ I bless God that ease came and the racking pain never returned.” He regularly referred to this incident, although it is impossible to determine whether his gout was never as excruciating as it was during that episode. 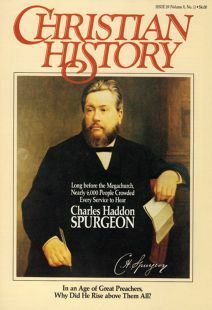 Spurgeon was seldom free from pain from 1871 on. The intervals between times of forced rest became increasingly shorter, and his condition became more complex as symptoms of Bright’s disease (chronic inflammation of the kidneys) began to develop. Beginning in the 1870s, Spurgeon regularly sought recovery and recuperation in Mentone, in southern France. Susannah Spurgeon also experiencing periods of invalidism. Like her husband, she found ways to be amazingly productive despite her illnesses. For example, she founded and operated a book fund that distributed countless theological works to pastors who could not afford to buy them. Where Is God During Suffering? Dr. Darrel W. Amundsen is professor of classics at Western Washington University and co-editor of Caring and Curing (Macmillan, 1988).